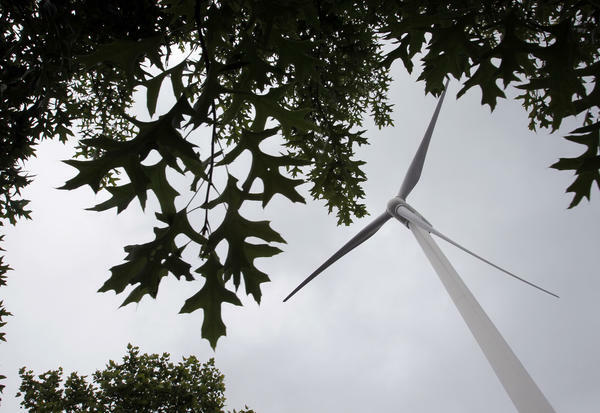 A Sinovel wind turbine is seen in Charlestown, Mass., in 2013. U.S. District Judge James Peterson on Friday ordered Sinovel to pay restitution and fines up to $59 million for stealing trade secrets. Last January, Sinovel was found guilty of stealing trade secrets in federal criminal court in Madison, Wis. The company paid an Austria-based employee of American Superconductor Corp. to steal its source code for software that powered wind turbines. This kind of intellectual property theft has been highlighted by the Trump administration as a reason for levying 25 percent tariffs on $34 billion of Chinese goods entering the U.S., which began on Friday. China retaliated with tariffs on $34 billion worth of U.S. goods. Sinovel was the largest customer of American Superconductor Corp. And then the Chinese company suddenly began rejecting shipments of American Superconductor's electronic components in 2011. The Massachusetts tech company learned that Sinovel was using a pirated version of the software it made in the wind turbines it installed. The ordeal left American Superconductor in perilous financial shape, and Wall Street analysts wrote it off as dead. The U.S. Department of Justice said that the company lost more than $1 billion in shareholder equity and 700 jobs. Earlier this week, American Superconductor announced it had agreed to settle the lawsuit against the Chinese company for $57.5 million in restitution. U.S. District Judge James Peterson said Sinovel has a year to pay the restitution and it must also pay a fine of $1.5 million. "Through Sinovel's and AMSC's joint efforts, we have signed a settlement agreement to resolve the previous disputes in a constructive manner that we believe will enable us to move on with our respective businesses," said Daniel McGahn, American Superconductor's president and CEO. "This closes a challenging chapter for AMSC."